Amazingly enough, after over a year, I finally got around to doing a rack of ribs on the Egg. 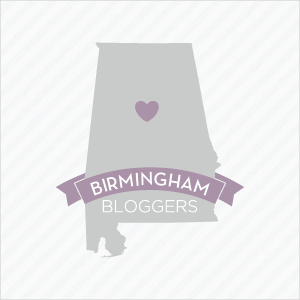 Today’s post is more about prep, pics and sauce than anything. The 3-2-1 Method for Spare Ribs has been covered ad nauseum by the rest of the Internet so I don’t feel a great need to re-hash the technique at length. 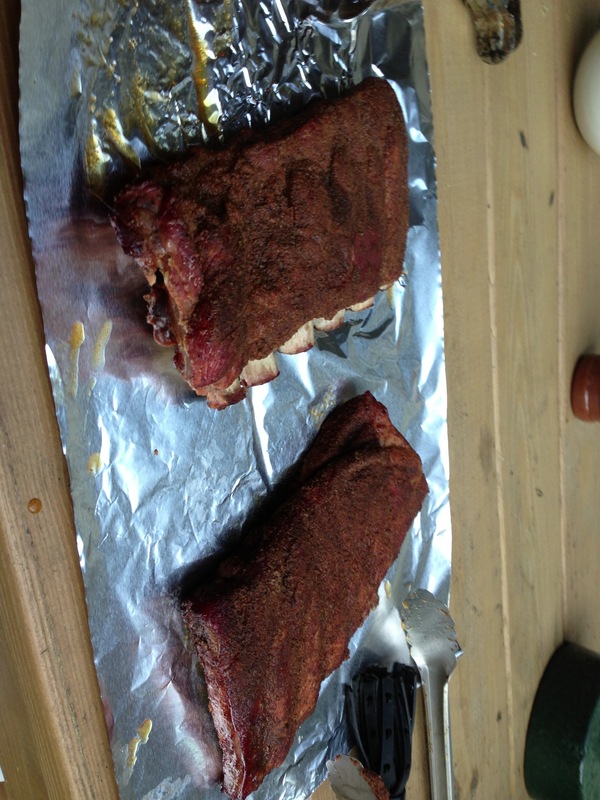 A basic overview of the cooking process is that you cook the ribs, uncovered for 3 hours over low, indirect heat. 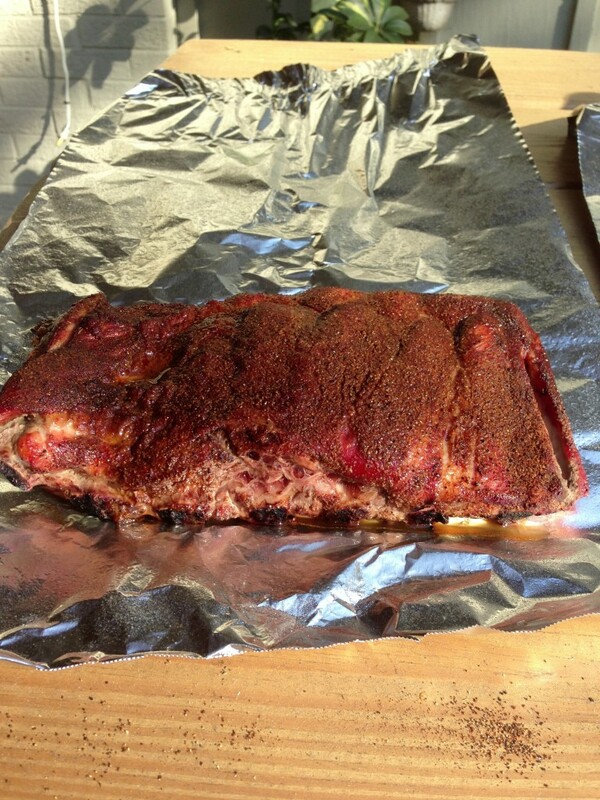 After 3 hours, you remove the ribs from the smoker, wrap them in heavy duty aluminum foil, with or without apple juice, and cook for another 2 hours. 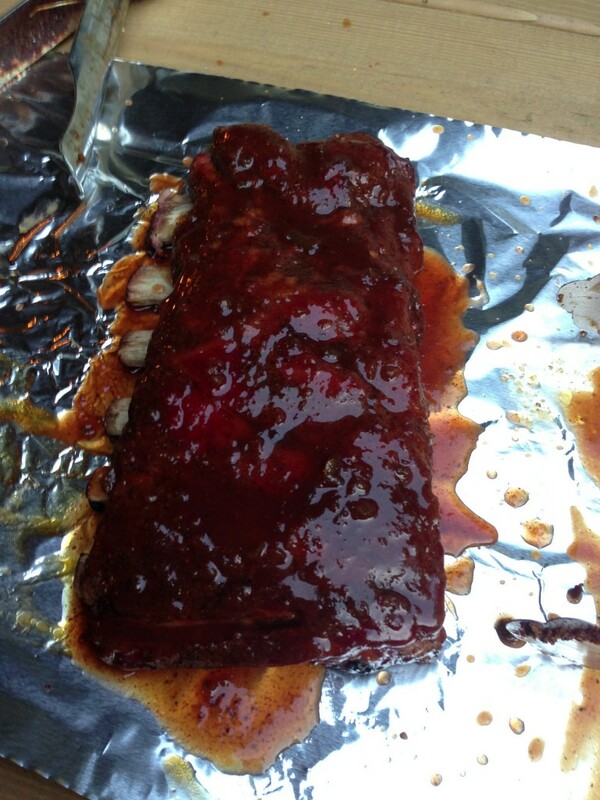 Remove from aluminum foil, mop with sauce of your choice and cook for another hour. 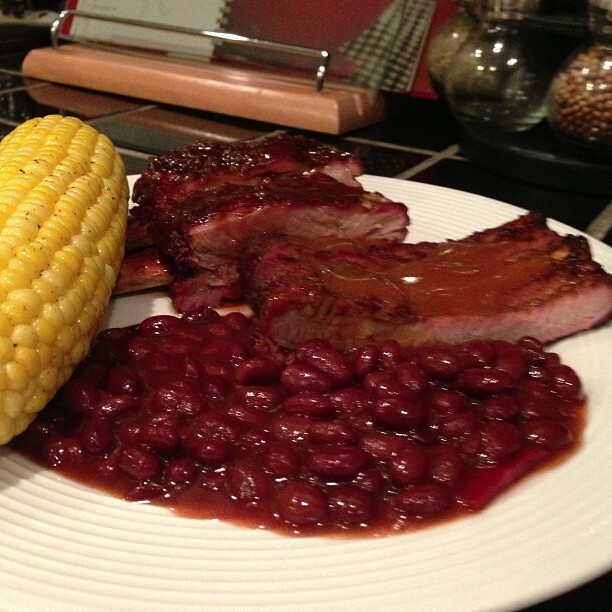 You can also 2-2-1 or 2-1-1 for baby back ribs. Whatever sauce you like. Since this was my first BGE rib attempt, I used two sauces. 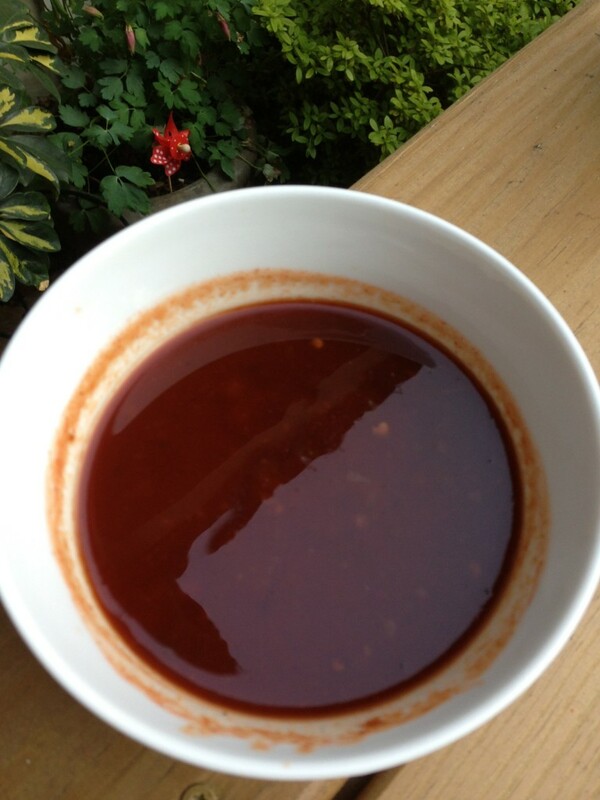 The first sauce was 4 parts Punk’s Smok’n Gourmet Pepper Sauce to 3 parts local honey, both from Pepper Place Market. This is a little more honey than they recommend (2 parts sauce to 1 part honey), but I didn’t want the end result to be overwhelmingly spicy. The control set, however, used Dreamland sauce, known the world over to be the best BBQ rib sauce to exist in a bottle. 1. Remove the ribs from the packaging. 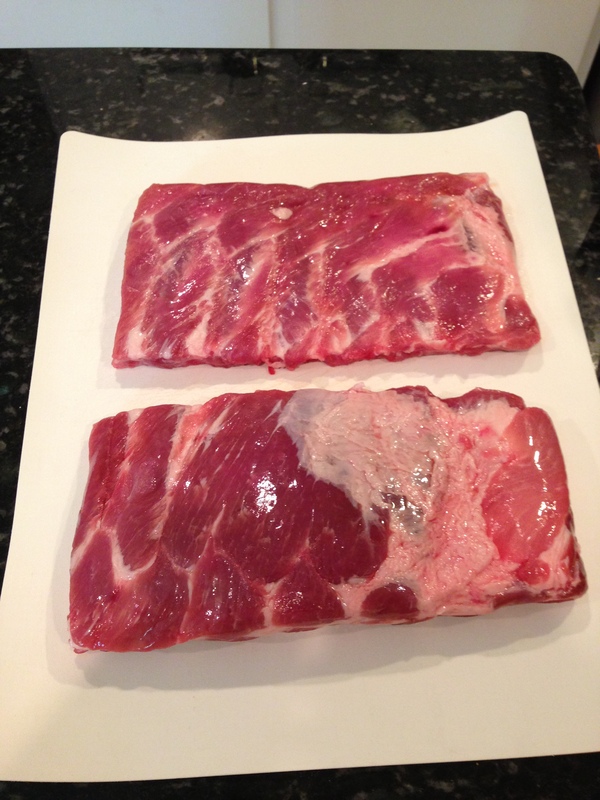 Use a knife to separate a corner of the membrane on the back of the ribs and pull the membrane away with your hands. Blot dry with a paper towel. 2. 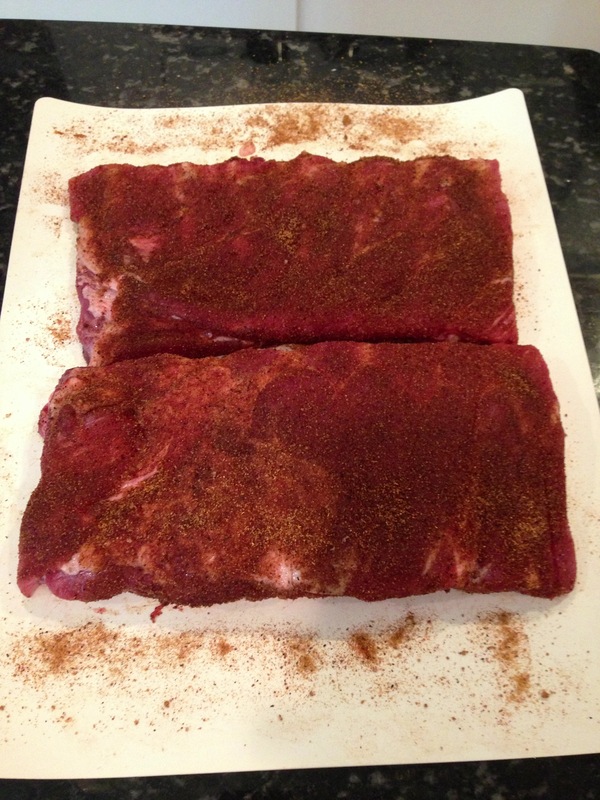 Put a heavy dusting of your rib rub on both sides of your ribs. FYI, the consensus was that the ribs cooked with the Punk’s sauce, then dredged through a little Dreamland sauce at the table were the best ribs. Punk’s ribs are in the back. Dreamland in the front.